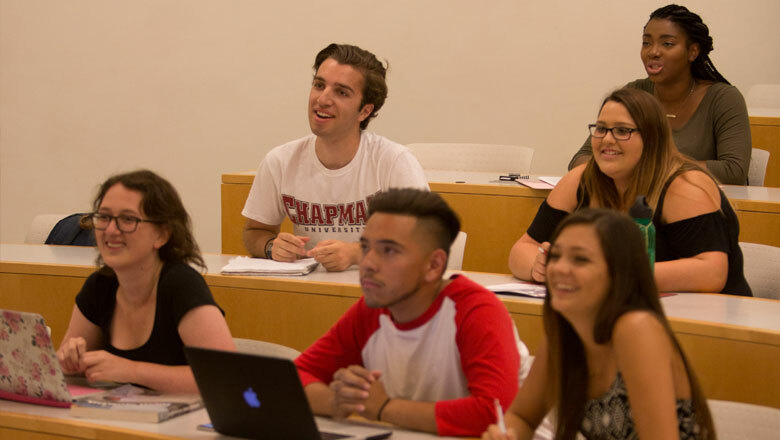 Academics at Chapman are more than just lectures, books and classrooms, and interdisciplinary is more than just a word. At Chapman, interdisciplinary means encouraging students to study abroad, actively fostering research and collaboration between faculty and students and structuring our general education program to allow students to explore all of their passions. Students at Chapman learn directly from distinguished world-class faculty including Nobel Prize winners, MacArthur fellows, published authors and Academy Award winners. Our small classes and close faculty relationships lead to a robust exchange of ideas and innovations that shape global leaders in the arts, sciences, humanities and beyond. The academic experience is designed to put our students on the path to a fulfilling life and career as culturally aware citizens before they leave. Whatever educational path you choose, Chapman will ask you to reach for a vision of yourself that is larger than you ever thought possible.